Acquisition de 50% des parts de Direct Océan par la société Freshpack. Frank Paque (left), managing director of Freshpack and Sebastien Roussel, of Direct Ocean. 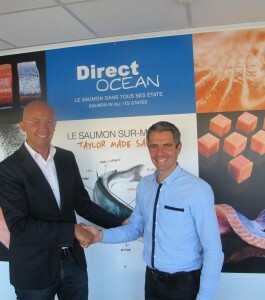 French seafood firm Freshpack has bought 50% of salmon supplier Direct Ocean from Philippe Barbe. Freshpack, which specializes in shrimp, crab and ready meals, has bought Barbe’s stake for an unspecified amount, Sebastien Roussel, who now holds the remaining 50%, told Undercurrent News. Roussel will continue to manage Direct Ocean, based in the French port of Boulogne-sur-Mer, where Freshpack is also headquartered, he said. The two firms will remain independent and there will be no merger, he told Undercurrent. Barbe is now retired from the business, but the rest of the Direct Ocean team, who have grown the business to around €75 million in turnover in 2014, compared to €24m in 2008, will stay in place, he said. Freshpack — which is owned by the Paque and Dutertre families, as well as Denmark’s Kangamiut Holdings — has turnover of around €50m and is very financially strong, said Roussel. He said Frank Paque, managing director of Freshpack and the son of Freddy Paque, one of the founders of Freshpack, was « the link who made the deal happen ». Although the two companies will remain separate, Freshpack’s solid balance sheet will allow Direct Ocean more financial power to expand. « You have to be bigger now, this is what it is all about, » said Roussel, pointing to the consolidation going on in retail customers. Last year, Undercurrent revealed Direct Ocean was in sale talks with Marubeni, the Japanese trading group. These talks did not result in a deal, however.